Updated July 25, 4:30 pm. Forte announced this afternoon that the corps will withdraw from the last three weeks of the 2012 Drum Corps International Tour. Originally with plans to sit out of the Edmond, Okla. show scheduled for July 25 and rejoin the Tour this coming weekend due to a transportation issue, the corps made the announcement later in the day that it will finish its 2012 summer season while the corps is situated in Denton, Texas, near its home base of operations. "Due to many hurdles along our journey, we feel that it is in the best interest of safety and welfare of the current members to end our season," interim director Christopher Todd said in a note posted to the corps' Facebook pages. Todd says he hopes that Forte will make a comeback to the DCI Tour in future years. ForteCorps.org Forte was scheduled to be part of the DCI Central Oklahoma event in Edmond on Wednesday evening. The Edmond lineup now includes: 7:55 PM – Revolution 8:12 PM – Oregon Crusaders 8:29 PM – Pioneer 8:46 PM – Intermission 9:00 PM – Pacific Crest 9:17 PM – The Academy 9:34 PM – Glassmen 9:51 PM – The Cadets All times approximate and subject to change. 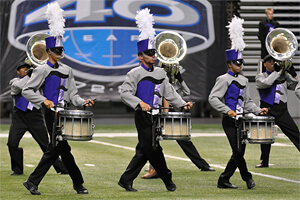 View the 2012 DCI Tour schedule.